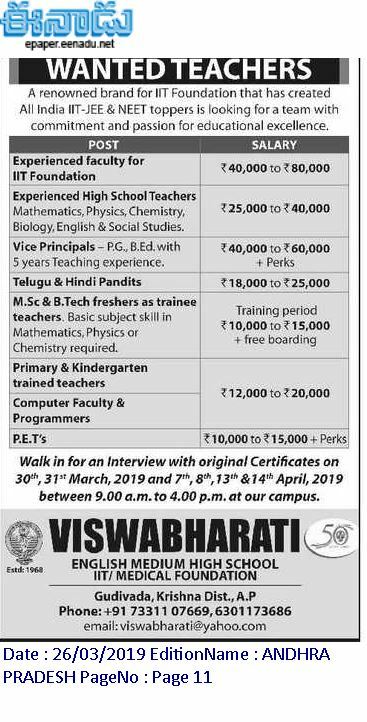 April 2019 for VISWABHARATI ENGLISH Medium High School Teachers . Interview start at 9 AM to 4 PM at school campus. Salary, Qualification , are given below. VISWABHARATI ENGLISH Medium High School. Walk-in Interview on March 30th, 31st , 2019 and April 7th,8th,13th,14th 2019. For teaching posts experience candidates are preferred. Vice Principals- P.G,B.Ed with 5 Years Teaching Experience. M.Sc & B.Tech freshers as trainee teacher.Basic subject skill in Mathematics, Physics or Chemistry requried. 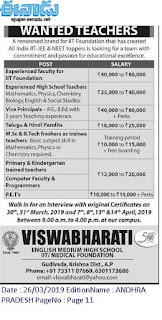 Eligible candidate can attend the walk-in Interview with original certificates on 30th , 31st , March 2019 and 7th, 8th, 13th, and 14th April 2019.